Envision participants in a School of Nursing Simulation Lab. 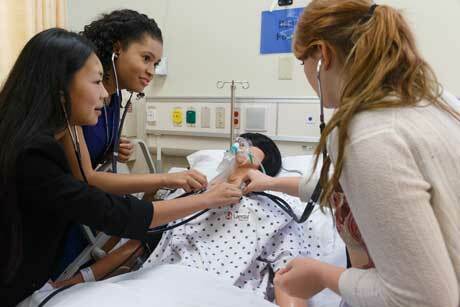 GW is helping more than 600 high-achieving high school students explore healthcare careers this summer. Many students think they want to pursue careers in medicine or health sciences, but need exposure to different careers to better understand their options. 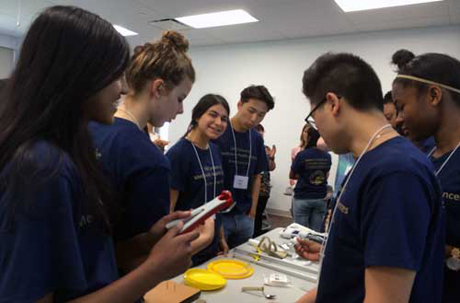 Three interactive and informative camps, offered through the GW School of Medicine and Health Sciences (SMHS) and the GW School of Nursing (SON), will help students make educated career path decisions. Two of the annual camps returned to campus this summer, while the third is new this year. SMHS offered their second week-long “Careers in Medicine and Health Sciences Summer Camp” from June 27-July 1, 2016. Forty students were selected from Loudoun County Public School’s (LCPS) Monroe Technology Center. These students, heavily female, are dual-enrolled in a LCPS high school and Monroe Tech’s Health and Medical Science program. These students, already focused on careers in the healthcare arena, gained a wealth of experience through six career sessions. The presenters were able to give them an eagle’s eye view into careers as a physician assistant, medical lab scientist, occupational therapist, physical therapist, EMT, or nurse through personal knowledge. Many of the presenters used hands-on exercises to help the students decide whether the career was right for them. For example, the occupational therapist created a scenario where each of the students had a disability (ex. being blind, unable to use one hand). The students were challenged to understand what it felt like to have a disability and how an occupational therapist works with patients. Students from LCPS's Monroe Technology Center explore medical equipment. Another camp, known as the GO GIRL (Genomic Opportunities for Girls In Research Labs™, is designed to provide hands-on laboratory experience in molecular biology and genomics to rising 10th, 11th and 12th grade young women enrolled in Loudoun County Public Schools. The girls have the opportunity to explore laboratory techniques commonly used in forensic and research laboratories using state-of-the-art research facilities at GW. This four-day summer program began in 2009 and is a joint effort between Shenandoah University’s Bernard J. Dunn School of Pharmacy (BJDSOP) and GW’s SMHS. This year there were an unusually high number of applicants for the 16 competitive slots. Shenandoah University’s Drs. Amanda Munson and Tracey Nickola started the program to inspire high school girls to pursue careers in the biomedical sciences. “There are a disproportionately lower number of girls in the sciences. An equal number of girls and boys might enter the biological sciences, but women tend to drop out of that pipeline a lot sooner. The pressures of working in industry and in academia, combined with the desire to have a family, seem to be part of the reason that a lot of women drop out of science,” said Dr. Munson. The GW School of Nursing, in collaboration with Envision, hosted the “Young Leaders Forum” focused on health care for the first time this summer. Envision, a company that specializes in “career exploration and leadership experiences for high-aspiring students,” brought two groups of students, totaling more than 500 students, to campus on June 22 and July 7. The students rotated through a series of six sessions throughout the day long experience, including five hands-on skills & simulation sessions and one panel discussion. The topics included Clinical Skills, Infection Control, Neurological Systems, Respiratory Assessment & Therapy, Quality & Patient Safety and a panel with working professionals speaking about their career choices. Overall, the camps helped some students confirm their interests, and for others to open their eyes to new possibilities. One of the students in the Careers in Medicine and Health Sciences Camp, Bria-Necole Biggs, is thinking about applying to be a volunteer junior EMT. “I was really excited to find out from the EMT presenter that I could apply. I didn’t know that was available for high school students.” This is just one of the ways students will began shaping their healthcare career paths.